Improved market conditions in the Philippines, aircraft delivery deferrals and lower fuel prices have significantly improved the outlook for Philippine Airlines (PAL). The Philippine flag carrier returned to the black in 2014 with a small profit and should be able to turn a more sizeable profit in 2015 following a profitable first quarter. The return to profitability in 2014 and 1Q2015 are mainly a reflection of lower fuel prices and improved market conditions, driven by consolidation and a new more disciplined approach to capacity in the Philippine airline sector. But the PAL Group also has made strategic and capacity adjustments since Lucio Tan took back control of Philippine Airlines and sister regional carrier PAL Express in late Oct-2014. Lucio Tan has slowed PAL’s fleet and network expansion. Five of the 10 A320 deliveries which were initially slated for 2015 have been deferred, enabling PAL to avert a potential return of overcapacity in the domestic and regional international markets in 2H2015. This is Part 5 in a series of analysis reports on the outlook for Philippine airlines. The first two reports looked at the performance and outlook of Cebu Pacific’s long-haul operation with a particular focus on the Philippines-Middle East and Philippines-Australia markets. The third report examined Cebu Pacific’s domestic performance and outlook, including the turnaround at its primarily domestic subsidiary Tigerair Philippines. The fourth report analysed the outlook for AirAsia’s Philippine operation, which includes affiliates Zest and Philippines AirAsia (PAA), following a recent restructuring. This report focuses on outlook for the PAL Group, which includes Philippine Airlines and regional subsidiary PAL Express. PAL Holdings includes Philippine Airlines and non-airline subsidiaries but does not include PAL Express. The Lucio Tan Group owns a 100% stake in PAL Express and about an 89% stake in PAL Holdings with the remaining 11% held by individual investors under the public float. The small annual profit for the year ending 31-Dec-2014 represents the first time PAL Holdings/Philippine Airlines was in the black since the year ending 31-Mar-2011 (referred to as FY2010 in the chart below). PAL in 2013 changed the end of its financial year from March to December. PAL in 2013 changed the end of its financial year from March to December. Therefore the loss for the quarter ending 31-Mar-2013 is included in both the YE Mar-2013 (FY2012) and YE Dec-2013 figures. PAL Holdings turned an operating profit of PHP2.373 billion (USD54 million) in 2014 compared to an operating loss of PHP6.455 (USD152 million) for 2013. The company reported an operating profit of PHP3.158 billion (USD71 million) in 1Q2015 compared to an operating loss of PHP801 million (USD18 million) in 1Q2014. Note: PAL in 2013 changed the end of its financial year from March to December. Therefore the loss for the quarter ending 31-Mar-2013 is included in both the YE Mar-2013 (FY2012) and YE Dec-2013 figures. PAL was profitable in 2Q2014 and 4Q2014 while it incurred losses in 1Q2014 and 3Q2014. The second and fourth quarters are typically by far the most profitable quarters for Philippine carriers. PAL’s 1Q2015 profit of about USD84 million is therefore particularly impressive and leaves the PAL Group well placed to remain in the black throughout 2015 and improve on the modest full-year profit figure from 2014. PAL Holdings also reported record annual revenues for the 12 months ending 31-Dec-2014 of PHP100.954 billion (USD2.278 billion). This represents a 36% increase compared to the PHP74.295 billion (USD1.754 billion) in revenues generated for the 12 months ending 31-Dec-2013. For 1Q2015 PAL holdings reported a 29% increase in revenues to PHP27.858 billion (USD628 million). The revenue growth for 2014 and 1Q2015 is partly driven by expansion of PAL’s international network. But the growth is also somewhat misleading as a large portion of the revenue gains booked in 2014 and 1Q2015 were generated from PAL’s interline/codeshare arrangement with PAL Express. PAL currently sells all PAL Express-operated flights. Before it rebranded and transitioned to a full-service regional model in 2013, PAL Express was known as AirPhil Express and operated independently as an LCC. 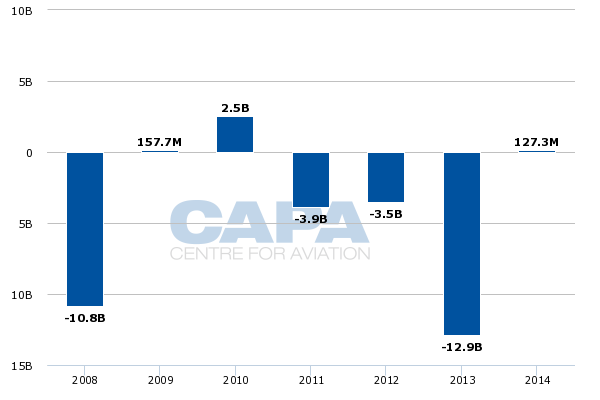 As CAPA highlighted in a Nov-2014 analysis report, the PAL Express domestic operation was profitable in 2014 but this was offset by large losses on its only international route, Manila-Dubai. PAL Express handed the Dubai route and its small fleet of single-class A330-300s to PAL mainline at the end of Mar-2015 and is now focusing entirely on the Philippine domestic market. As a result PAL Express should be able to generate a profit in 2015. All 15 of the PAL Group’s A330-300s are now operated by PAL mainline, including eight aircraft which are in single-class 414-seat configuration and seven aircraft which are in two-class 368-seat configuration. Eliminating the sub-fleet at PAL Express is a sensible move as operating only two widebody aircraft and one long-haul route was inefficient. PAL has been seeking to reduce the size of its A330 fleet through subleases since Lucio Tan took back control in late Oct-2014. As CAPA highlighted in early Nov-2014, PAL’s new management team determined the carrier only needed seven or eight of the 15 A330-300s. All 15 of these A330s were ordered by the previous management team and ownership group and delivered within a remarkably quick span of 15 months between Sep-2013 and Nov-2014. PAL has since been able to improve utilisation of the A330 fleet by starting to use the type on the Honolulu, Melbourne and Sydney routes. But based on current schedules in OAG, PAL is still only utilising its A330 fleet an average of about nine hours per day. In addition to Honolulu and Australia, PAL currently operates A330s on all of its Middle East routes – Abu Dhabi, Dammam, Dubai and Riyadh. According to OAG data, PAL also currently deploys the A330 on some regional international flights to Bangkok, Hong Kong and Tokyo and some domestic flights to Cebu and General Santos. All four of the Middle East routes as well as London were launched in 2H2013 as part of an ambitious international network expansion initiative under San Miguel. Not surprisingly PAL’s international operation was highly unprofitable as these routes spooled up, particularly as the expansion occurred during a period of intensifying competition in the Philippines-Middle East and Philippines-Europe markets. Conditions in the Philippine international market improved significantly in 4Q2014 and 1Q2015. At the same time PAL’s new international routes have started to mature as it has now been over one year since they were launched. But most significantly PAL has benefitted from the sudden reduction in fuel prices, which has caused several international routes to swing from losses to profits. London, which was launched in early Nov-2013 and incurred large losses in its first year of operation, has particularly benefitted from lower fuel prices as the route is operated with inefficient A340s. PAL also has benefitted from securing Russia overflight permissions in late Oct-2014. In its first year of operating to London PAL had to use a longer less efficient route that avoided Russian aerospace. PAL’s London performance should improve even further from 2Q2015 as in late Mar-2015 it was finally able to reschedule its London flights. PAL had to make do initially with an afternoon arrival slot in Heathrow, which required an early morning departure from Manila, making it impossible to pursue connecting passengers. Its London flight now departs Manila in the early afternoon and lands in London in the evening. PAL wisely slowed down the rate of international growth in 2014, dropping plans to add new long-haul destinations in Australia, continental Europe and the Middle East. PAL also plans to pursue only modest international growth in 2015. New York, Port Moresby in Papua New Guinea and Quanzhou in China are the only planned new international destinations for 2015. New York was launched in Mar-2015 as a tag to some of PAL’s A340-operated Vancouver flights while Port Moresby and Quanzhou are slated to be launched in Jun-2015 with A320s. All the new routes are relatively low risk as Port Moresby and Quanzhou are low frequency short-haul routes while New York is being operated as an additional sector from Vancouver with pick-up rights. The decision to slow down the expansion of the long-haul network however has led to an excessively large widebody fleet. In addition to the under-utilised 15 A330s PAL under San Miguel acquired six ex-Iberia A340-300s which delivered in 2013 and early 2014. These aircraft are now used on the Manila-London and Manila-Vancouver-New York routes as well as on some flights from Manila to Los Angeles and San Francisco. Most of PAL’s Los Angeles and San Francisco flights as well as the Manila-Vancouver-Toronto route is operated with its much more efficient fleet of six 777-300ERs. PAL should be able to further improve its international performance if it is able to succeed at reducing the size of its A330 fleet. PAL’s new management team continues to seek out potential sublease deals although finding airlines has been challenging, particularly for the single-class aircraft which PAL is more keen to remove. The new PAL management team is also keen replace the A340-300s as soon as possible, although the reduction in fuel prices perhaps reduces the urgency to acquire new widebody aircraft. Lucio Tan also inherited an overly ambitious narrowbody fleet plan when it took back control of PAL. But PAL’s new management team was able to quickly address this issue by deferring 10 A321 deliveries that were initially scheduled for 2015 and 2016 as part of a deal with Airbus that was forged in Jan-2015. This reduced PAL’s A321 delivery commitments for each year from 10 to a more manageable five aircraft. PAL initially placed orders in 2012 for 44 A321s, including 34 A321ceos and 10 A321neos. In Mar-2014 PAL exercised eight A321neo options as part of a deal with Airbus which reduced its A330-300 commitments from 20 to 15. As part of the Jan-2015 deal forged by the new management team, 10 A321ceos were deferred from 2015 and 2016 to 2020 to 2024 and converted into A321neos. In addition PAL ordered two more A321neos. This lifted PAL’s A321neo commitments from 18 to 30 aircraft while reducing its A321ceo commitments from 34 to 24 aircraft. The PAL Group’s narrowbody jet fleet currently consists of 18 A321s and 22 older A320s, according to the CAPA Fleet Database. The A320s are spread across PAL mainline and PAL Express with some of the PAL Express-operated aircraft in single-class configuration. All the PAL mainline A320s and A321s are in two-class configuration. The 18 A321s are all from the order placed in 2012 and include two aircraft which were delivered in 1Q2015 and two aircraft which have been delivered so far in 2Q2015. The fifth and final A321 delivery for 2015 is expected by the end of 2Q2015, giving the group a narrowbody fleet of 41 aircraft consisting of 19 A321s and 22 A320s. The Group also has a fleet of nine Bombardier Dash 8 turboprops which are operated by PAL Express in regional markets, primarily to airports which cannot accommodate jets. The original plan for 10 A321 deliveries in 2015 was overambitious and would have likely resulted in overcapacity in the Philippine domestic and/or regional international markets. Five aircraft is more manageable as it results in relatively modest growth for PAL in the domestic and regional international markets. PAL does not have any A320s leases expiring in 2015 but does have some leases expiring in 2016, which should give the PAL Group the flexibility of keeping its narrowbody fleet at about the 41 aircraft level in 2016 as the final five A320ceos are delivered. The group will also have the flexibility of maintaining the current size of its narrowbody fleet over the long term as the 30 A321neos that are now on order can be used to replace the existing A320ceos and eventually the A321ceos. PAL has use the additional narrowbody capacity from the recent deliveries to expand in the regional international and domestic markets. In the domestic market the PAL Group has resumed six point to point domestic routes from Cebu. PAL Express launched at the end of Mar-2015 services from Cebu to Bacolod, Butuan, Cagayan de Oro, Davao, Iloilo and Tacloban. All these routes were dropped by the PAL Group in early 2014 and have since been only served by Cebu Pacific and – in the case of Cagayan de Oro and Davao – by AirAsia. PAL Express also has re-launched at the end of Mar-2015 point to point domestic services form Iloilo to General Santos and from Davao to Zamboanga. Cebu Pacific was similarly left as the only operator on these routes after PAL pulled out in early 2014. Under San Miguel, the PAL Group implemented a new domestic strategy which resulted in a large drop in domestic capacity as the group suspended point to point routes bypassing Manila and transferred almost all domestic trunk routes from PAL mainline to PAL Express. Prior to San Miguel taking control in 2012, PAL and PAL Express (then known as AirPhil) both operated domestic trunk routes with PAL focusing on the top end of the market and AirPhil the bottom end. In 2014 PAL mainline carried slightly less than 800,000 domestic passengers, representing a 69% reduction compared to 2013, according to Philippine CAB data. This was partially offset by an 18% increase in domestic passenger traffic at PAL Express to 5.1 million passengers. 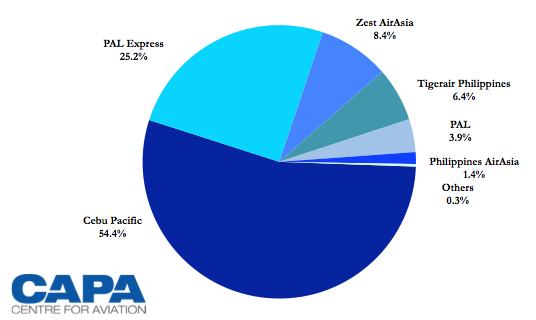 The PAL Group overall saw its domestic market share slip from 33% in 2013 to 29% in 2014. As outlined in Part 3 in this series of reports, the PAL Group has steadily seen its market share erode over the last 10 years as Cebu Pacific and other LCCs have rapidly expanded. 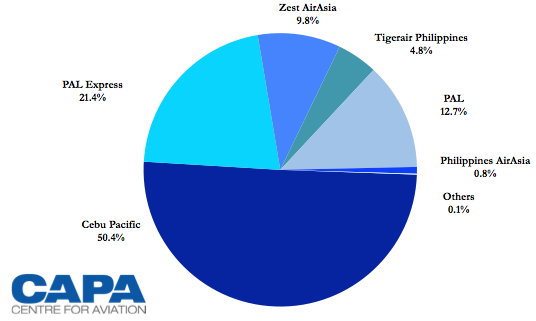 In 2005 the PAL Group captured 63% of the Philippine domestic market. Cebu Pacific overtook the PAL Group as the largest domestic player in the Philippine market in 2009 and has since continued to widen the gap. The domestic expansion planned by the PAL Group for 2015 could result in the group regaining domestic market share and narrowing the gap with market leader Cebu Pacific, but only very slightly. 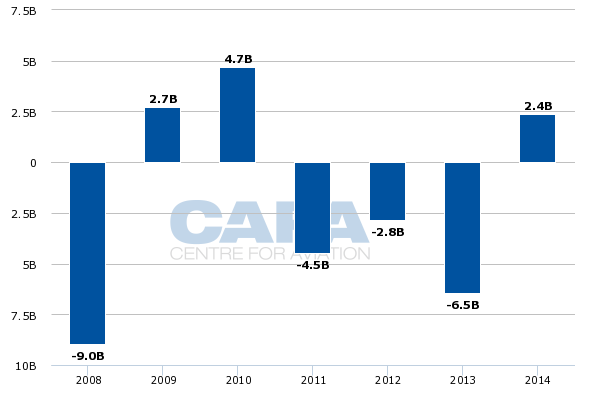 The expansion is still very modest relatively to the capacity cuts implemented by the PAL Group in recent years. The capacity added by the PAL Group and similar domestic expansion by other carriers should also be absorbable given the fact that the overall Philippine domestic market saw flat domestic passenger growth in both 2013 and 2014. All Philippine carriers have benefitted from consolidation in the domestic market, driven by the capacity reductions at the PAL Group, the Philippines AirAsia-Zest partnership (which should eventually result in the two carriers merging) and Cebu Pacific’s acquisition of Tigerair Philippines, which was recently rebranded as Cebgo. The consolidation has resulted in only three players competing on domestic trunk routes compared to as many as six in 2012. Domestic yields and load factors improved significantly across all Philippine carriers in 2014, boosting profitability of the Philippine airline sector. 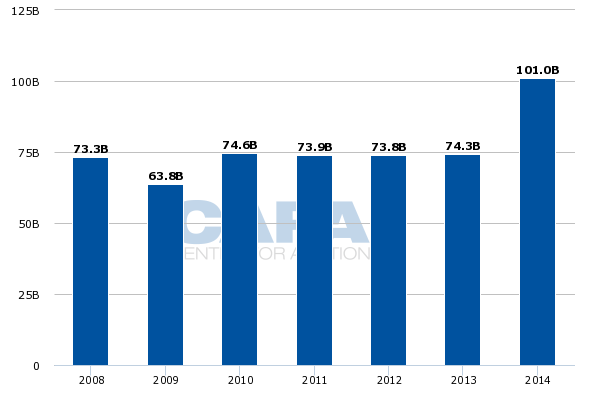 As CAPA previously highlighted, the Philippines was the only market in Southeast Asia which saw an improvement in profitability in 2014. More improvements are likely in 2015, leading to potentially even higher profits in the Philippine domestic market. The Philippine regional international market could however be more challenging in 2015 due to capacity growth in most North Asia markets. New bilateral agreements have created opportunities for expansion in the Philippines-Hong Kong and Philippines-Taiwan markets while Philippines-Japan continues to see rapid growth after initially opening up in late 2013. But inbound demand from North Asia is also growing. And Philippine carriers are well positioned to pursue some strategic growth in the increasingly competitive Philippines-North Asia market given the lower oil prices and the profits they are able to generate in domestic and other international markets. Overall the PAL Group along with its two main local competitors – Philippines AirAsia/Zest and Cebu Pacific/Cebgo – are well positioned to continue posting improvements to their bottom lines. Market conditions are favourable across most sectors with capacity and demand relatively well balanced. PAL has been able to avert overcapacity by making adjustments to its fleet plan. A few more tweaks, particularly with the A330 fleet, would be ideal and would further brighten the group’s outlook. But even if it continues to struggle to find homes for its excess A330s PAL’s turnaround should be sustainable for at least the short-term.